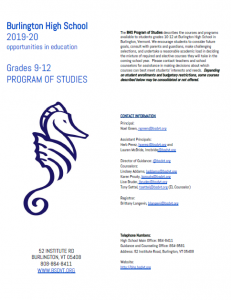 Burlington High School offers a comprehensive and challenging college preparatory program with an emphasis on academic excellence and intellectual curiosity, as laid out in our Program of Studies. about 100, most have pursued graduate study, and nearly 78% hold a Master’s Degree or higher. Faculty members are active in regional and national professional organizations. Over 160 course offerings, primarily college preparatory or honors classes, are available. Honors level achievement is designated by an asterisk (*) on student transcripts. Grades are unweighted. Theory, Spanish, Statistics, Studio Art, U.S. Government and Politics, U.S. History, Environmental Studies, and World History. Qualified students may enroll concurrently in college and university courses. remedial skills, and support programs such as ASPIRE and the Student Support Center.